I'm not one of those guys that gathers tech news items and reposts them to increase my page views or hits, but this is going to be an exception. 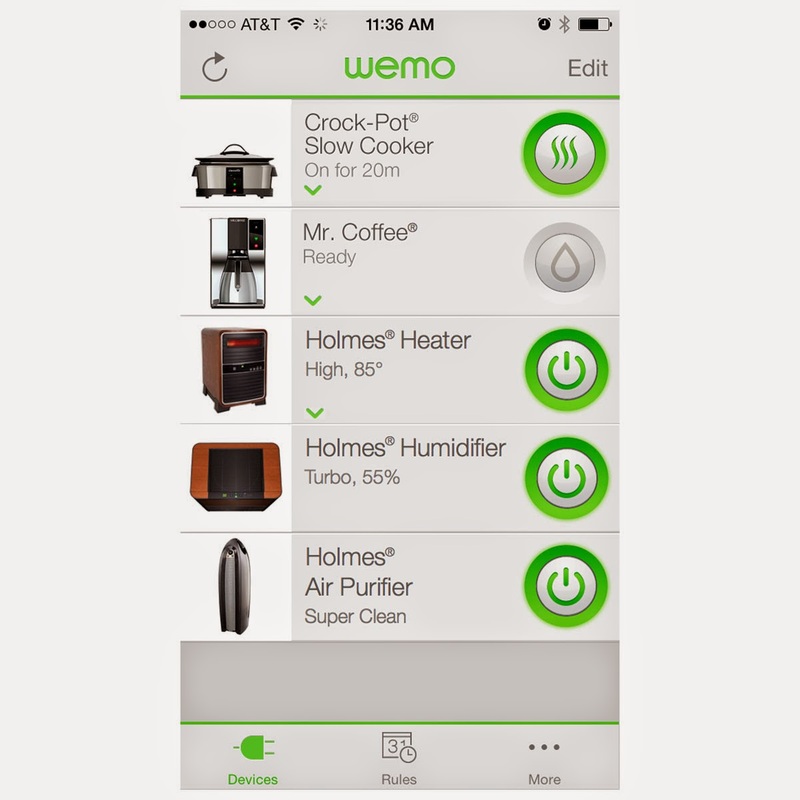 I was prowling around looking for ideas for a particular problem I'm having with the Wemo devices I have and ran across a cool news item <link>. Basically, it says that Belkin is expanding their line of WiFi controlled devices to include light bulbs, slow cookers, coffee makers, humidfiers, and who knows what else. This is so cool. Imagine, a coffee pot with an internet address. I stole the picture and put it here because the advertisement will probably disappear soon. The link is from the CrockPot web site <link>, and is for a Wemo based slow cooker that is going on my 'gottahavethatthing' list. Being a widower, I use a slow cooker a lot and this would be great to have. But look, space heaters, humidifiers, coffee makers, what will they think of next? Sure, I use things like this to control or monitor a lot of devices and I could probably build my own remote controlled coffee maker, but the neighbors can't. Now, they can just buy it. So, it looks like Belkin is in this marketplace big time. They actually published their API for Android (yes, I downloaded it) so other people can get into the arena. With the library work in Python and several other languages, the home hacker can start building nice controls for their own use. Normal folk can use the free phone app and do much the same with no work (or personal satisfaction). Home automation is looking better all the time. It's good to Belkin in the market with Home Automation devices. I have a Samsung SmarTV. They have a complete SDK for it. I really like Samsung and we will be getting another one only much bigger soon. Then the TV development phase begins. The way the marketplace goes, I've resisted directly hooking into devices because the API will usually change 12 times in 5 years, but Samsung is such a great company! I don't buy enough stuff to learn about manufacturer's products until the cell phone this year. I'm a Samsung convert. That's almost too close to the truth to be funny. Thanks. The internet toaster has been out for years. It was first done as a demonstration of internet control back in the 90's at COMDEX. The other interesting item done there was a demo of IP over two tin cans and a piece of string.....it actually worked. Although the toaster never made it into mass production. Dave, can you put links to your previous WEMO posts in this please? Your wish is my command. All the work on Wemo devices was using a Raspberry Pi because that little device excels at web interaction. A bit of a warning though. The Wemo library is in constant flux. I recently had to redo my code to catch up with changes to the library and the author is making more right now. I expect him to have a new and very different library out in a few days, so I'll be changing the code again. That's actually why I haven't posted more code and techniques for control. When the library becomes somewhat stable again, I might adopt it. As of now, I have the old problem of the Wemo routine losing touch with the device solved. Unless there's something new to add, I may not upgrade it at all. I've been working with Z-Wave (on the Razberry board for the RPi) so other than the light switches, I'm not sure I need anything else. Might use Z-Wave light switches as well in the future and just move the Wemo switch I have to the front door. That way the light can be checked and turned on from the light around the corner from the house by whoever is coming home.